Must pasta insist we default to basil and oregano when seasoning the accompanying sauce? Does Indian cuisine demand we pay homage to proteins with basmati rice, potatoes or Naan? Break free the chains! 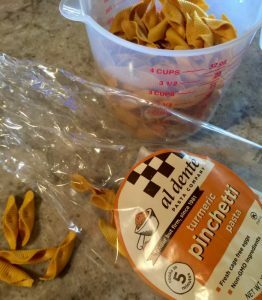 Particularly now since Al Dente’s latest line of Piccola Pastas have hit market shelves to switch things up. My last post, Pastazanella, was inspired by local tomatoes and Al Dente’s new Bonneti Pasta. The duo created a tantalizing riff on a classic Panzanella substituting pasta for bread. Lentils are substituted for grinds in this not-so-typical Ragu. Today’s blog substitutes their new Turmeric Pinchetti Pasta for the starches used in traditional Indian food. I substituted, as well, lentils for the expected meaty grinds typically used in classic Italian ragus. The switch-a-roos make for a lovely October plate–– especially nice when we want to warm up to the heat and spice of sub-continent food and use cauliflower in the peak of her crowning glory. The recipe accommodates six healthy appetites––leftovers always a bonus. 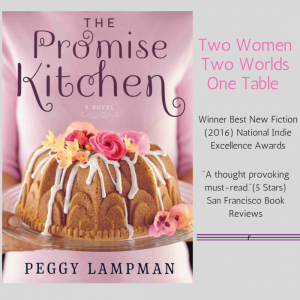 I can’t sign off without alerting those interested that my publisher slashed the price of THE PROMISE KITCHEN to only $6.99 through October. It may be a good way to share your love ~not to mention cross an early gift off the list~ with great food fiction accompanied by a slew of well-tested recipes. Heat 2 tablespoons olive oil in a large sauté pan. Add onions and sauté 2 minutes. Stir in ginger, garlic, curry, cumin and coriander and continue cooking an additional 2 minutes, stirring occasionally. Stir tomatoes into seasoned onions; break up tomatoes with a fork. Simmer tomatoes an additional minute and then stir in lentils. 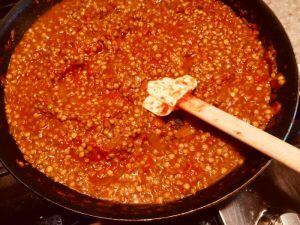 Cook lentils in sauce until tender, about 35-45 minutes, stirring in 1/2 cup stock or water as needed to insure lentils don’t stick to pan, as you would do when making a risotto. While lentils are simmering, bring a large pot of salted water to a boil for the pasta. Toss cauliflower florets with remaining 2 tablespoons of olive oil and arrange on a foil-lined baking sheet. Roast cauliflower on middle-rack of oven 6-8 minutes or until florets are tender and golden brown. When lentils are tender, stir roasted cauliflower into the pan. For extra richness, if desired, stir ghee or butter into ragu. Season with cilantro and pepper flakes. Boil pasta for five minutes, according to package instructions, and drain. 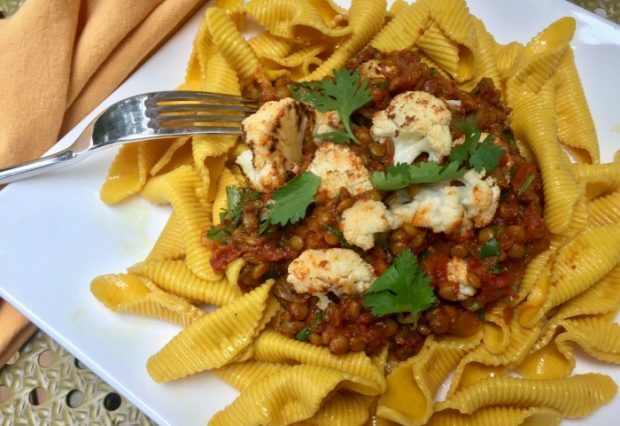 Serve with Lentil-Roasted Cauliflower Ragu. Abuela’s Pumpkin Flan with Caramel Sauce for Thanksgiving! Sounds wonderful! Turmeric and lentils are two of my favorite things so I’ll definitely be giving this a try. Thanks, Peggy!